“So where do you live?” A casual question which is usually always followed by a casual answer. Except my answer isn’t so casual, and the questions that follow when I give “my van” as a response are aplenty. Here are the 10 common questions I get asked about living in my van. What made you decide to live in a van? I had $2500 in savings and I could have either spent that on moving into a house where I would have to share a room with someone, or I could buy a van, live in it, go on road trips every weekend, and sell it at the end of summer and make my money back. It just made so much more sense to me. Also, I really liked the idea of living a little rough for a short amount of time. I felt like I had become unappreciative and lazy when it came to life. Now I appreciate the small things, such as when a friend offers me a shower in their house, and a working toilet. How long are you going to be living in your van for? I originally planned to live in my van for three months: May-July. Now I plan on living in it until October. Not paying rent is addictive; rent basically eats away at half of your pay check. 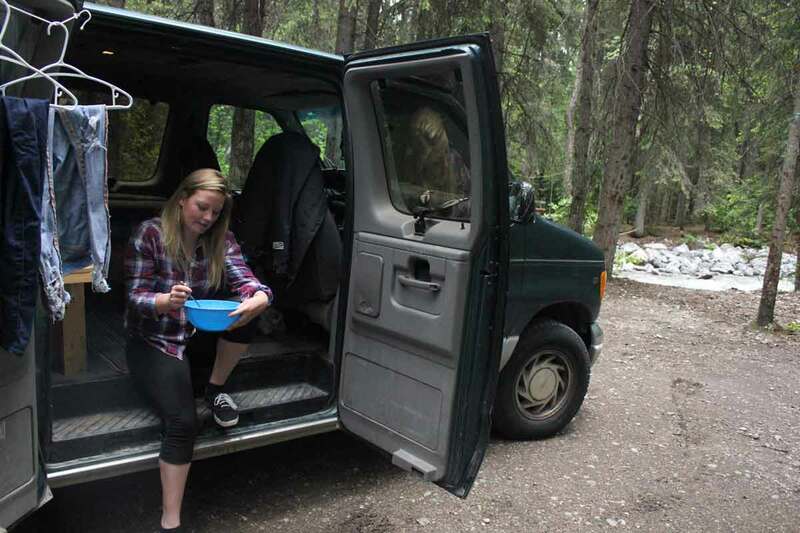 I won’t be living in my van over winter, especially not in Banff where it can get as cold as -40 Celsius! I use the bathroom where ever and whenever I can. For some reason, since I’ve started vanlife my body has decided I need to pee three times more than usual. It’s like my bowels just panicked and now I need to pee all the damn time. But to answer the question, I make use of toilets at work, restaurants, public rest rooms, and the forest. I’ve resorted to peeing in a McDonald’s cup on a few occasions. If I can offer one piece of advice about peeing outside it’s this: never do it on concrete. Unless you have great reflexes. I honestly need a shewee. Maybe they’ll sponsor me after reading this article. Don’t you get lonely living in a van by yourself? Yeah. The first month was really hard. I’m naturally an introvert, so I was very surprised to discover I missed human interaction when I first started living the vanlife. Some nights it was very, very hard and I contemplated moving out of the van and into a house just because of how lonely I felt. The good thing about this however was that it made me appreciate the friends I had, and it encouraged me to come out of my shell and make new friends. How much money are you saving by living in your van? Rent in Banff ranges from $600-$800 a month, for a shared room. I average on spending $25 a week on fuel, and around $100 a month on car insurance. I’m managing to save quite a bit of money living this lifestyle. 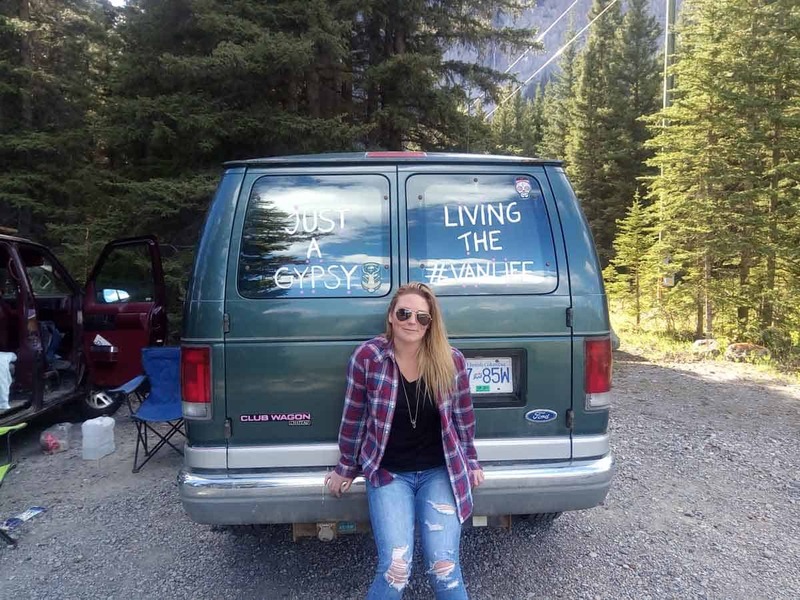 Want to learn more about my life living in a van? How do you cook your meals? Most of the time I eat out. Banff has some great food specials. I also go to the local supermarket and buy shredded chicken and a premixed bag of vegetables and make a salad, or make use of the deli section. When I’m not so lazy I make soup or stir fry on my portable propane stove. I also have a chilly bin I sometimes fill with ice to keep my food cool, although the melts within a day now that it’s summer so I’ve given up on that. I now use dehydrated vegetables to get my greens by adding them to soups, pasta or stir fry. Where do you park your van? Currently I park in my friends driveway as it is technically illegal to freedom camp in Banff because it is a national park. I make use of car parks and free camping sites when I am travelling. There are actually a lot of good places out there and it’s not hard at all to find a place to sleep. Don’t you get scared living in a van by yourself? The first night was terrible. I had a nightmare where I woke up screaming. I dreamed there were bears outside my van, and they were trying to break into my van to eat me. The fact I was parked in the woods at this free campsite, so it probably wasn’t the best place to begin my vanlife adventure! You can read about my first week living in a van here. I purchased a gym membership and I shower there every morning. I’ll also admit I’ve had the odd baby wipe shower. What’s the worst thing about living in a van? I look like Lady Gaga and Edward Scissorhands’ love child when I emerge from my van each morning. Then I have to ride my bike to the gym (usually in my pajamas, because I am lazy and all I care about is diving into the shower as soon as possible), walk into the gym and face the receptionist as I scan my card and politely ask for a towel. But that’s not as bad as when a mosquito sneaks into the van. 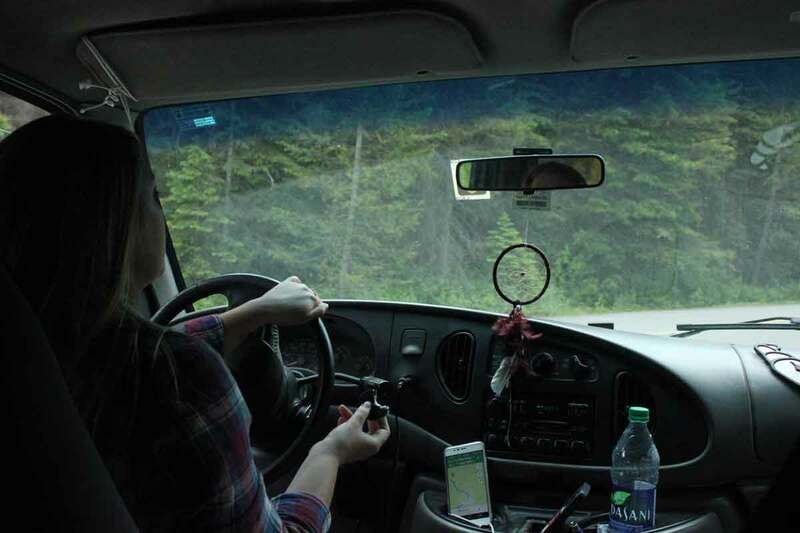 I hope you enjoyed my answers to the 10 Common Questions I Get Asked About Living In My Van. For more articles on living the #vanlife you can click here. Do you have a question you’d like to ask me? Comment below! Thanks Maria! I try and be as honest as possible about vanlife- it’s not easy at times but for the most part it’s a great way to live. Awwww man I loved this post! I have to admit this is kind of a dream of mine, who wouldn’t want to save all that money on rent, utility bills and all the maintenance cost that comes with it! I’m curious if you have a camping fridge in the van for juice, food water or do you just stop and get stuff whenever you need something? 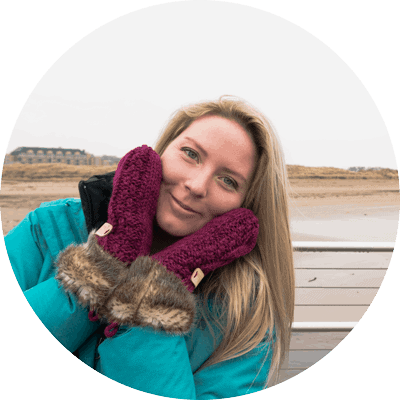 Your post gave me a giggle a few times… look forward to reading more of your adventures! Hi Lisa! I have a chilli bin I can put ice in but I hardly use it unless I go camping. I tend to buy food most days as it’s just easier and that way i’m not taking up too much space storing food in my van. One day I plan to buy a van in the UK or NZ and build it from the inside and then i think I will install a fridge. It’s challenging not having one but you adapt! I’ve always been curious about van life. It isn’t a possibility here in India because I would be very scared about my safety. We do drives sometimes but that’s the extent to which it goes. It has been my dream to try it atleast once in my life. I hope I get the chance soon. Hi Penny, you should try it in Canada or New Zealand- they’re both great spots for vanlife. Good luck and if you need any advice, don’t hesitate to contact me! This is the most entertaining post I’ve read in a while. Hats of for the guts to do things differently! This is fab! Well done on making a big lifestyle change in order to save money and do something different! Loved reading your answers. We house sit and move every few weeks with a couple of suitcases and have been technically homeless since September last year! We are saving a lot of money too. I love this, I think you’re awesome girl! 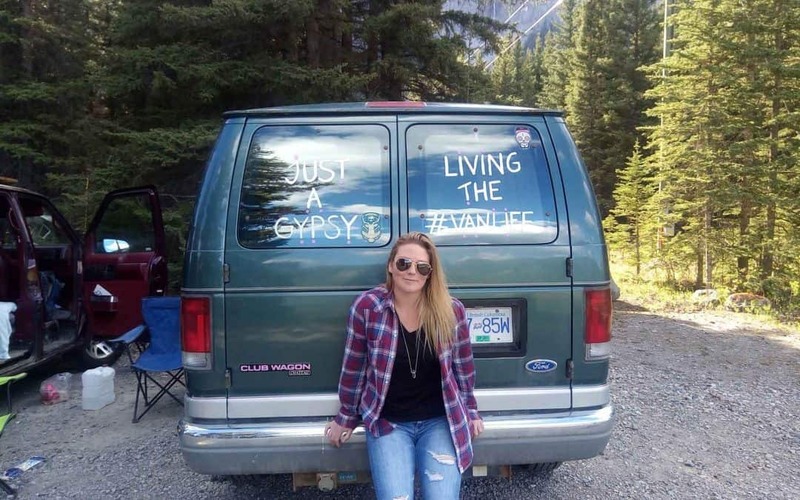 So cool you just decided to live in a van on your own! I would also like to try it for a while in the future :). I really wanna learn how to surf better and living in a van for a while, waking up next to the ocean seems like a dream! Keep sharing your stories and inspiring others with your awesome lifestyle!! I’m gonna follow you! This is seriously so crazy! I can’t imagine doing this, but how cool that you are. I wish you the best! So awesome!